There’s nothing more spectacular than the views of our beautiful mountains during the month of October. The bright red dogwoods, yellow poplars, and oranges of the maples make a swath of color as far as the eye can see. Of course, there are plenty of ways to enjoy the color of this beautiful season, and one is as easy as looking out your car window. Whether you’re driving through the High Meadows Golf & Country Club neighborhood, shuttling back and forth between cities on Highway 21, or enjoying a leisurely drive on the Blue Ridge Parkway, the views are stunning at every turn. But it’s also fun to get out and enjoy the fall color up close. The crisp fall air seems to beckon us outdoors, and there’s something about the sound of leaves crunching underfoot that just feels fun. We’re lucky to have our very own walking trails right here in the High Meadows Golf & Country Club community. 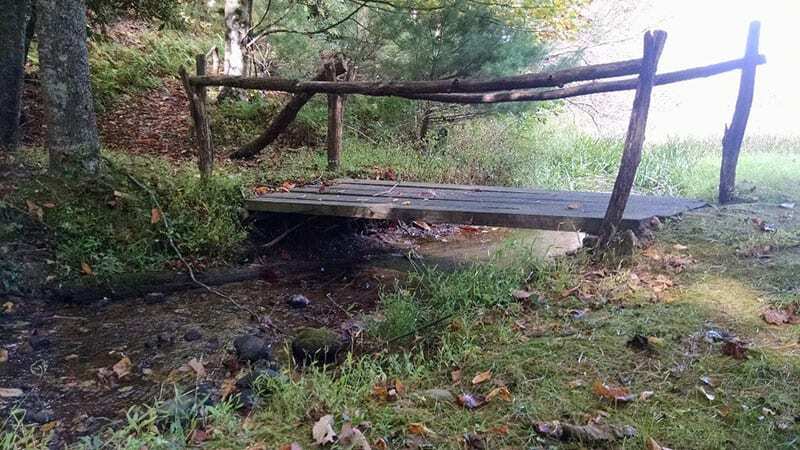 Thanks to the work of one of our members a few years ago, you can get off the beaten path and enjoy nature, without embarking on a strenuous hike. The High Meadows walking trail entrance is marked with a sign to the right off Country Club Road, right before the area where the road breaks off for visitors to bear left to go to the front entrance of the clubhouse. After walking a few feet down the path, you get to another sign pointing left that says “Easier Trails.” Whether you choose to go right or left, the paths are wide enough for two people to walk comfortably. Take the trail to the right, and you walk through woods filled with oaks, hollies and rhododendrons. While the trails are just a few yards away from the golf course, the cover of the woods is enough to make you feel like you’ve gotten away from civilization. The trail is marked most of the way by moss-covered logs lining the path, but even where there aren’t logs it’s easy enough to see where to go by the well-worn trails. After you pass by the pond and fountain at the foot of hole 10’s green, you start a gradual climb uphill, to the point where the trail circles around and you walk back to the beginning. Take the trail to the left, the one marked easier, and after a somewhat sharp descent down a few stairs, you find yourself at a picturesque picnic area. 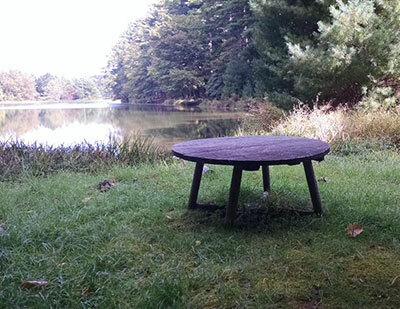 A round table sits in a grassy space where you have a clear, open view of the colorful trees beyond the golf course. Whether you pause for a picnic or just a moment to enjoy the view, when you’re ready to walk you will enjoy a much flatter path through the stately pine trees that line hole 11. 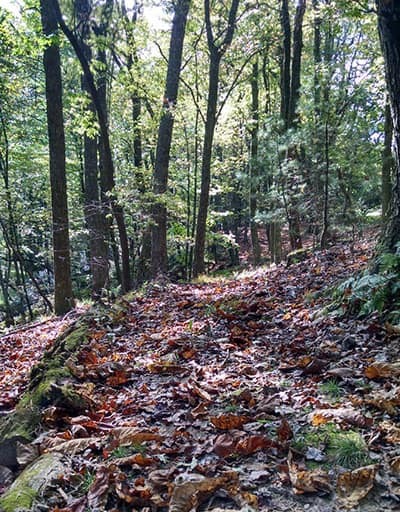 While nothing can beat the convenience of hiking trails right in your own community, the walking trails at High Meadows Golf and Country Club are just one way to enjoy the mountains during this beautiful fall season.